Arkansas Rushes to Execute 8 Men Using Drug Linked to Painful, Botched Executions | Democracy Now! attorney with the Death Penalty Clinic at the University of California, Berkeley, School of Law. The state of Arkansas is planning to execute eight men within a 10-day period in April—that’s nearly a quarter of its entire death row population. Earlier this month, Republican Governor Asa Hutchinson signed proclamations setting four execution dates for the eight inmates between April 17 and 27, which would be an unprecedented rate of executions in modern U.S. history. Arkansas has suspended executions since 2005 amid challenges in acquiring lethal injection drugs, and lawsuits over the drugs used. Arkansas says it is rushing the executions because the state’s supply of the sedative midazolam will soon expire. For more, we speak with Megan McCracken, an attorney with the Death Penalty Clinic at the University of California, Berkeley, School of Law. AMY GOODMAN: The state of Arkansas is planning to execute eight men within 10 days in April. That’s nearly a quarter of its entire death row population. Earlier this month, Republican Governor Asa Hutchinson signed proclamations setting four execution dates for the eight prisoners between April 17th and April 27th, which would be an unprecedented rate of execution in modern U.S. history. Arkansas suspended executions since 2005 amidst challenges in acquiring lethal injection drugs, and lawsuits over the drugs used. Arkansas says it’s rushing the executions because the state’s supply of the sedative midazolam will soon expire. For more, we’re going to Philadelphia, where we’re joined by Megan McCracken, attorney with the Death Penalty Clinic at University of California, Berkeley, School of Law. Megan, can you explain what exactly is happening? Because a drug is about to expire, eight men will be executed within 10 days? MEGAN McCRACKEN: That’s right. The state of Arkansas has said that because its supply, its current supply, of midazolam expires at the end of April, it has scheduled these eight executions very close together, four days within the course of 11 days, in order to use the drug before it expires. AMY GOODMAN: What is midazolam? AMY GOODMAN: Who supplies it? MEGAN McCRACKEN: That’s not known. Arkansas, like many states, has secrecy surrounding its execution procedure and specifically protects that type of information—how they got the drugs, who made it, you know, exactly what that product is. AMY GOODMAN: It’s been linked to painful botched executions in states like Alabama and other places. Can you explain, when you talk about it’s not even the proper drug? MEGAN McCRACKEN: Right. So, because it’s not an anesthetic drug, it cannot maintain anesthesia, meaning it can’t keep the prisoner insensate to pain and suffering. We’ve seen, time and time again, when midazolam is used in executions, things don’t go as planned. And so, we have seen executions, like Dennis McGuire in Ohio, Clayton Lockett in Oklahoma, Joe Wood in Arizona, where the prisoner remained alive much longer than anticipated, and then the eyewitnesses describe struggling, writhing, gasping. AMY GOODMAN: Let me go to the January 16, 2014, execution in Ohio of Dennis McGuire, using an untested two-drug method, despite warnings it might cause immense suffering. The execution took 25 minutes. His son, also named Dennis, witnessed the execution. DENNIS McGUIRE: Shortly after the warden buttoned his jacket to signal start of the execution, my dad began gasping and struggling to breathe. I watched his stomach heave. I watched him try to sit up against the straps on the gurney. I watched him repeatedly clench his fists. It appeared to me he was fighting for his life, but suffocating. The agony and terror of watching my dad suffocate to death lasted more than 19 minutes. It was the most awful moment in my life to witness my dad’s execution. I can’t think of any other way to describe it than torture. AMY GOODMAN: That’s Dennis McGuire, son of Dennis McGuire, executed by the state of Ohio in 2014. Megan, we have 30 seconds. 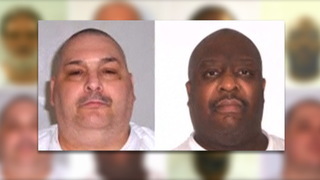 Is this set in stone that these men will be executed in Arkansas? I mean, this country has never seen anything like this. MEGAN McCRACKEN: That’s right. I mean, that is certainly the plan that Arkansas has for moving forward. But it’s not an appropriate plan. This drug is not effective and appropriate for this use. And there’s no reason to rush to carry out these executions by the end of April, when other drugs are available, and even this drug continues to be available to other states. And so, it’s really a manufactured situation that can be avoided. AMY GOODMAN: —at the University of California, Berkeley, School of Law.